Jordy De Wijs scored a late winner as Hull City came from behind to beat Wigan Athletic and keep their Championship play-off hopes alive. Nick Powell fired Wigan ahead just before the break when he met Reece James' cross to fire low into the net. The hosts levelled early in the second half when Christian Walton spilled Kamil Grosicki's shot into the path of Fraizer Campbell, who slotted home. And De Wijs earned Hull all three points when he headed in from an 89th-minute corner. Hull's late winner claws them to within five points of the play-off places heading into the final stages of the season. The hosts had threatened early on and were unfortunate not to take the lead when Campbell set up Marc Pugh, who chipped an effort against the crossbar. Defeat for the Latics, meanwhile, means they have won just once in their past 11 games and have now failed to win in 20 away matches so far this season. Paul Cook's side were without the injured Michael Jacobs and Callum McManaman and struggled to see the game out as defeat left them two points above the relegation zone with five games to play. "We talked about it before the game, don't underestimate the opposition. They have the threats. "We changed the formation and the personnel, there was a great finish from Fraizer, and credit to Andy Crosby, we do a lot of work on the training ground on set-piece and we said at half-time there was a mismatch on the player marking Jordy, if we get the ball in the right area and if there delivery is right he'll get a free header and he did that in the 89th minute. "It's exciting as we found a way to inject urgency, get the win and keep the season alive." "Is it disappointment? Is it deja vu? Whatever you want to call it, it's just us. "It's just the way it is. It is irrespective of formations, tactics, everything else. It continues to be individual errors that cost us. "We have the ability to give teams goals and nothing changes. It's a pattern. If you keep picking the same players, with the greatest respect, the same thing will happen. "We've got a massive challenge on with five games to go. We've got to cut out individual errors, but it's a little bit boring now." Match ends, Hull City 2, Wigan Athletic 1. Second Half ends, Hull City 2, Wigan Athletic 1. Fraizer Campbell (Hull City) is shown the yellow card. Jordy de Wijs (Hull City) wins a free kick in the defensive half. Goal! Hull City 2, Wigan Athletic 1. 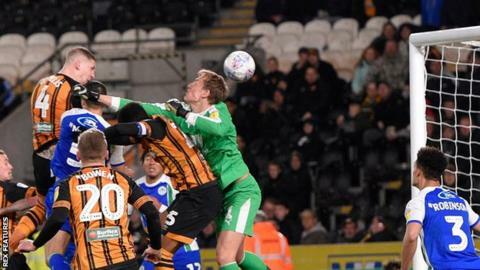 Jordy de Wijs (Hull City) header from very close range to the top left corner. Assisted by Kamil Grosicki with a cross following a corner. Corner, Hull City. Conceded by Sam Morsy. Substitution, Wigan Athletic. Lee Evans replaces Darron Gibson. Substitution, Hull City. Chris Martin replaces Todd Kane. Fraizer Campbell (Hull City) wins a free kick on the right wing. Attempt missed. Fraizer Campbell (Hull City) header from the left side of the six yard box is just a bit too high. Assisted by Daniel Batty with a cross. Gavin Massey (Wigan Athletic) wins a free kick on the left wing. Attempt missed. Evandro (Hull City) right footed shot from outside the box is just a bit too high following a corner. Corner, Hull City. Conceded by Darron Gibson. Substitution, Hull City. Evandro replaces Markus Henriksen. Attempt saved. Gavin Massey (Wigan Athletic) header from the right side of the six yard box is saved in the centre of the goal. Assisted by Josh Windass with a cross. Corner, Wigan Athletic. Conceded by Eric Lichaj. Attempt missed. Kamil Grosicki (Hull City) right footed shot from a difficult angle and long range on the left is too high from a direct free kick. Christian Walton (Wigan Athletic) is shown the yellow card for hand ball. Hand ball by Christian Walton (Wigan Athletic). Attempt missed. Fraizer Campbell (Hull City) left footed shot from outside the box is close, but misses to the left. Daniel Batty (Hull City) wins a free kick in the defensive half. Substitution, Wigan Athletic. Leon Clarke replaces Joe Garner. Substitution, Hull City. Daniel Batty replaces Marc Pugh. Marc Pugh (Hull City) wins a free kick in the attacking half. Attempt blocked. Joe Garner (Wigan Athletic) header from the centre of the box is blocked. Assisted by Nathan Byrne with a cross. Corner, Hull City. Conceded by Antonee Robinson.